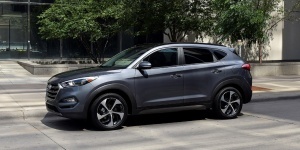 For 2018, Hyundai Tucson Sport features a stronger 2.4-liter 4-cylinder engine. Heated front seats and a 7-inch color touchscreen with Android Auto and Apple CarPlay are now standard on SEL and above trims, while SEL Plus and Limited trims now also feature Blue Link Connected Care, Remote Services & Guidance. A heated steering-wheel is standard on Limited trims. Get the best price for the Hyundai Tucson of your choice from a dealer in your area. Request a price quote now.